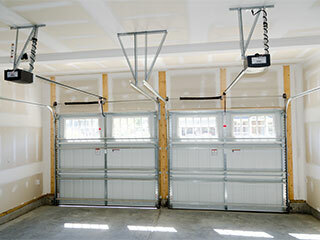 Aren't you sick of having to open and close your garage door manually? The last thing you want to do when you get back from work is to have to get out of your car, open your garage, get back in your car, drive inside it, get out of your car again, and then close your garage back up. Phew. We're exhausted just thinking about it. We can only imagine how you must feel, knowing that you'll have to go through all this again tomorrow, not to mention, every following day. Well, don't worry. There's a way to avoid all this hassle. An opener can be the answer to your inconvenience. It will make operating your garage door as simple as pushing a button. There are many options for you to choose from and trying to recognize which model and what features are the ones best suited for your particular home can give you a real headache. Our experts can help you take everything into consideration and find the best possible option. As great as these units can be, they can suffer from the occasional malfunction. That's where our team comes in. If your door suddenly refuses to open, or only "agrees" to open halfway, something is most likely wrong with your opener. Our specialists have a wealth of experience to draw from, and can handle every type of problem your opener might be experiencing. Sometimes, simply realigning the safety sensors is all it takes. Other times, a gear has worn-out and need to be replaced, or perhaps an electrical wire has gotten fried and the opener's circuit board must be inspected to determine if the fault lies with the wire itself or if there's an underlying cause. Whatever is causing the problem, you can rest assured that our specialists are more than capable to quickly hande the issue. If you're looking for the best deal in town, then look no further. Our experts at Garage Door Repair Miami can help you choose the best type of opener out there. If you already have an opener and require some professional assistance, we're the ones to call.